Our goal is to be the resource any one of us could need at any point in our lives. We help individuals with disabilities achieve milestones in independence from birth through later life. We are there at the beginning with early intervention therapy for babies / toddlers and therapy services for children. 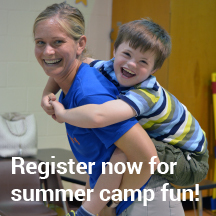 We grow with your family with autism services, camp and respite programs. As your family ages, we assist with transition services, employment assistance, veteran programs and community day supports. As your family changes, we provide answers for independence through assistive technology, deaf services, home modification services and driver evaluation/training. Help us help others achieve milestones of independence . . .
Erionna’s story focuses on how we are helping a 6-year-old in physical therapy. Therapist Kathleen Brinegar is working with Erionna and her family as she is making progress on sitting, holding her head up, standing and becoming mobile with her gait trainer. Kayla is an 18-year-old intern at Project SEARCH East who works with coordinator Keith Fox in learning the skills she needs to obtain a position in the healthcare industry. The year-long program is assisting Kayla as she figures things out. Samantha is a 25-year-old young woman who worked with our employment division to get her career going after she had an accident that caused a traumatic brain injury. Sam works at the Benjamin Harrison YMCA and she is truly making her way. Scott is an individual who worked with our certified driver rehabilitation specialist / occupational therapist Mary Follman to assist him with vehicle modifications. Scott was involved in an accident when he was 24 years old that resulted in paralysis from the waist down. Scott’s vehicle modifications are helping him in maintaining independence. Watch the one-minute video here; longer videos about each of our featured consumers will be available soon!